Multiple sclerosis (MS) is a complex disease with a variety of symptoms. The symptoms of MS differ greatly from patient to patient and also depend on how fast the disease progresses. Symptoms usually last from one day to several days, but can even last for months at a time. The severity of MS symptoms ranges from mild to severe. Often times, the initial symptoms of MS are short in duration and relatively mild, and normal function returns fairly quickly. Therefore, the symptoms of MS are often overlooked by a patient until the disease progresses. When symptoms of MS appear, it’s often called an attack. The medical term for this is an exacerbation. When this occurs after a period of time, it’s called a relapse. When a person recovers from the MS symptoms, it’s called remission. Relapsing-remitting MS is the name used to describe this coming and going of symptoms. Progressive MS is another type of MS when the symptoms do not go away. Progressive MS can be further divided into primary and secondary, depending on the stage of the illness. 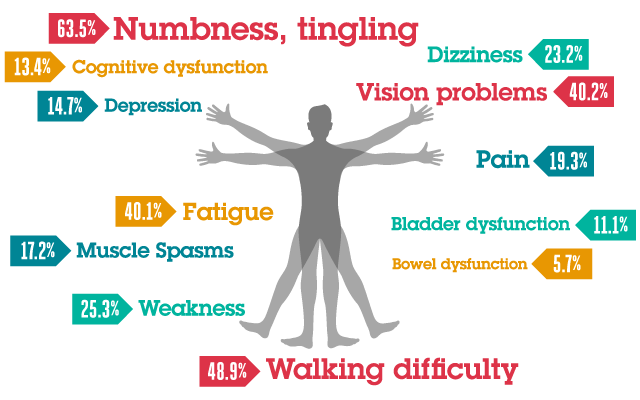 MS diagnosis is not simple, mainly because the symptoms of MS are often very similar to other neurological diseases and conditions. Transverse myelitis can also be due to viral infections and neuro-inflammatory problems instead of MS. When this happens, plaques in the brain that are characteristic to MS are not present, therefore MS can be ruled out as a diagnosis. Another disorder associated with transverse myelitis is called neuro-myelitis optica. In this disorder, antibodies work against a specific protein in the spinal cord called the aquaporin channel. Patients diagnosed with this disorder may respond differently to treatment than most MS patients. The majority of people diagnosed with MS experience muscle weakness, stiffness, and spasms. In some cases, this can be so severe that standing and walking become difficult or paralysis occurs. Many patients have reported that heat exposure makes these symptoms worse. Muscle spasticity occurs when a muscle spasms for an extended period of time. Spasticity can be mild to highly severe in patients with MS. If spasticity is severe, the spasms can be very painful, uncontrollable, cause joint tightness and pain, and affect walking ability. Burning and tingling sensations are also common in those with MS. Additionally, patients have reported loss of sensation and numbness. A characteristic sensation that occurs in patients with MS is the feeling of a sharp electrical spike that moves down the spine. This is called the ‘Lhermitte’s sign’. Pain is rare in early MS, and typically occurs with trigeminal neuralgia and optic neuritis. Trigeminal neuralgia is a neurological disorder that affects the nerves of the jaw, face and cheeks. Painful limb spasms can also be a cause of pain in those with MS. Difficulties with balance and coordination are also common symptoms of MS. Some may even experience uncontrolled trembling that affects the limbs, head, and body, which is present during movement. Studies have indicated that the majority of people diagnosed with relapsing-remitting MS need walking assistance within 15 years of an untreated diagnosis. Ataxia is the most common balance problem, which is characterized by uncoordinated movements caused by damage to parts of the brain that coordinate movement. People who suffer from severe ataxia typically need a walker, cane, or other type of assistive device and benefit from visiting a physical therapist. Fatigue is most common during MS exacerbations and it can be long-lasting. Fatigue can be both physical and psychological. Physical fatigue is often characterized by tiredness in the legs, while psychological fatigue is usually a result of depression. When fatigue occurs, a patient is typically instructed to avoid excessive activity and heat. Heat is known to aggravate symptoms of MS.
Urinary problems such as loss of bladder control and urgency to urinate are also common signs of MS. In some cases, MS patients also develop constipation and the inability to perform sexually. Depression commonly accompanies MS. Usually, those with MS suffer from mild depression, but a small number may develop more severe psychiatric disorders, such as paranoia and bipolar disorder. Thinking, memorizing, and learning can also be affected in those with MS, especially as the disease progresses. Individuals often have periods when they cannot express themselves or forget how to perform simple, everyday tasks. Early signs of cognitive dysfunction are often ignored because they tend to be very mild. Vision problems are commonly experienced in MS cases, but permanent blindness rarely occurs. Damage to the myelin and optic nerve inflammation are two factors that can cause a number of vision problems, such as graying and blurring of vision, loss of color vision, blindness in one eye or both eyes, decreased depth perception, or scotoma. Scotoma is the presence of a dark spot located in the center of the visual field. Jumping vision is a term used to describe uncontrolled vertical and horizontal eye movements that can occur in those with MS. This can be mild to severe and can impair one’s vision. Double vision or diplopia occurs when the eyes are not well-aligned. If a pair of muscles that controls certain eye movements is not coordinated, due to MS-induced weakness, this condition may occur. Tremor is commonly developed in MS. Uncontrollable shaking is often triggered by movement and can be disabling if severe. This is commonly referred to as pseudobulbar affect. Inappropriate laughing and crying occur which are not related to the actual mood of the individual. For example, a person who is experiencing this may be happy when they cry or vice versa. MS is a difficult disease to live with. The symptoms of this incurable disease are not only uncomfortable, but can be life-altering and even life-threatening as well. If not treated properly, MS may progress quickly and cause decreased function and quality of life. Therefore, it is highly recommended that individuals consult their doctor if they are concerned about MS and follow doctor’s recommendations in order to alleviate the signs and symptoms.